I’m a complete sucker for a nice illustration, I think we all are. The emotional impact beautiful artwork can have on a book can be quite incredible. This is something Flying Eye Books seem to excel in and my book today is one such example. 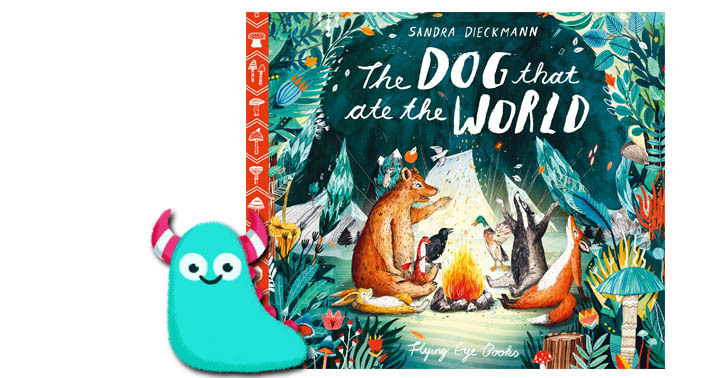 The Dog that Ate the World by Sandra Dieckmann and Flying Eye Books is a superb example of inspiring storytelling and the most beautiful illustrative work. 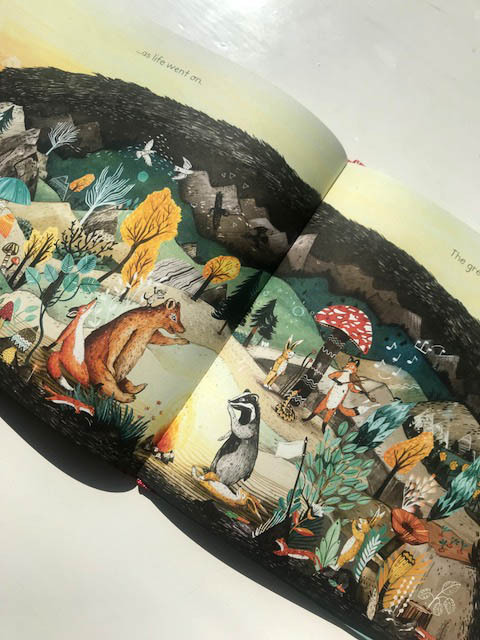 The Dog that Ate the World takes us to a forest full of different animals, all quite happy living their own individual lives, birds with bird, foxes with foxes, bears with bears etc. However, when a black dog arrives and starts to eat up each animal, and their whole surroundings, their world. It’s a bit of a fantastical and surreal story in a lot of respects and has the feel of a traditional folk tale, with a lot of importance and meaning behind it. Fundamentally, this is a story of friendship, of community and of surviving over adversity. Because within the belly of the black dog the animals start a new kind of life, where the different species come together and celebrate in their new life. 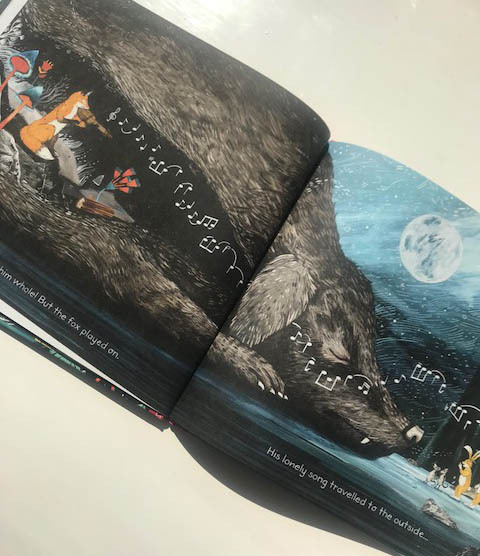 Change is something many of us can struggle with, so what a brilliant story to show children how change, even when it seems bad, can lead to positive outcomes. This book is a fantastic simple example of diversity and segregation. None of the animals in this story have a particular problem with each other, they just don’t mix, yet when their home is turned upside down, they come together and find so much more joy in this unity. It’s a rather dark story on the surface, and yet there is SO much happiness and pleasure that comes from it. 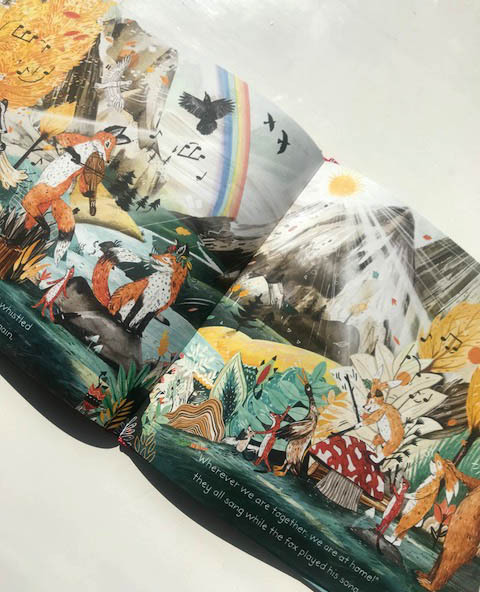 Now back to the illustration that I mentioned earlier in the blog, because the real joy and celebratory feel in this book comes not only from the words on the page, but so much so from the stunning illustration. Sandra has depicted dark and light so incredibly creatively in this story. The back dog is big, dark and threatening. There is something quite scary about the way he silently swallows up the beautiful world the animals inhabit, and yet something even more beautiful grows within him when the animals fight back and celebrate their new world. It’s whimsical yet pertinent. 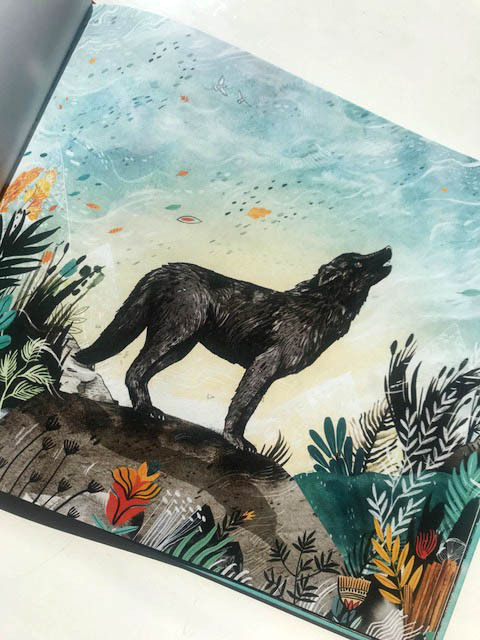 The pages are bursting with colour and depth, a predominantly turquoise and orange colour palette which is so attractive to look at, and shouts cheerful sunshine and joy from every single page, despite the black dog’s looming presence. It is beautiful! I would like to frame every page and put them on my walls. The final spread in particular is incredible gorgeous and a fantastic finale to a brilliant story. 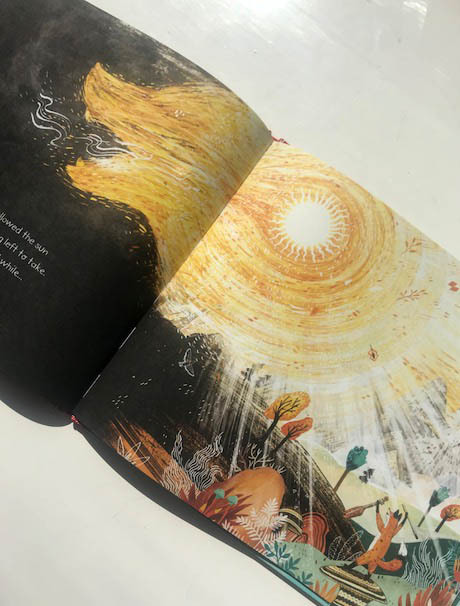 The Dog that Ate the World is an amazing creation, sumptuous artwork combined with an important yet interesting story. Perfect for us in the classroom and as a story time treat. The Dog that Ate the World is now available from all good book shops and libraries.